This modest brass plaque commemorates a soldier who won no fewer than three DSOs. Until the 1993 DSO was awarded for rewarding individual instances of meritorious or distinguished service in war. It was a military order, until recently for officers only, and normally given for service under fire. When awarded to more junior officers it was an indication they'd just missed out on winning a VC. 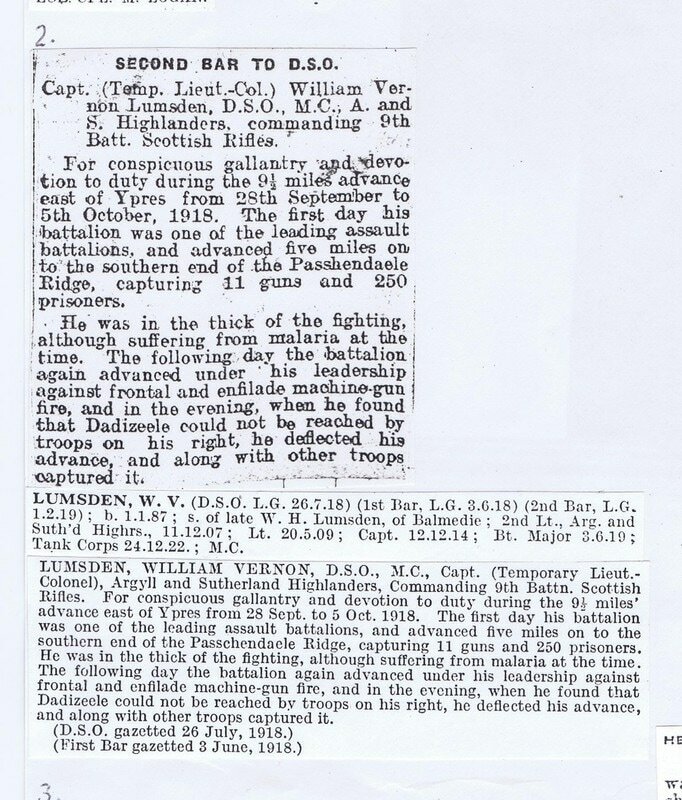 William was commissioned into the Argyll and Sutherland Highlanders as a 2nd Lieutenant on 11/12/1907. He was promoted to Lieutenant on 20/5/1908, temporary Captain on 12/9/1914 and Captain on 12/12/1914. He qualified to instruct at a qualifying range taking (mekometer) class at School of Musketry at Hythe in 1912. He sailed with 1st Bn. to India in 1909. He seconded to the Machine Gun Corps as a Brigade Machine Gun Officer on 15/5/1915 and served with the Machine Gun Corps until 5/2/1916. He was promoted to Temporary Major in the MGC on 15/5/1916. From 19/6 until 30/7/1917 he was Acting Lieutenant Colonel. William transferred to a Service Battalion of the Scottish Rifles (Cameronians) on 30/7/1917 and became a Temporary Lieutenant Colonel on 7/4/1918. On 9/10/1919 William relinquished his temporary rank of Lieutenant Colonel and was reinstated to the rank of Temporary Major while commanding A Company In the Tank Corps on 24/10/1921. On 26/6/1923 he re-joined the Argylls and served with the 9th Battalion. He became a Major on 7/4/1924. At some point he also became Adjutant of the Battalion, as it is recorded he relinquishes the appointment of Adjutant on 16/3/1925. He then listed on the reserve of Officers as lieutenant Colonel 20/3/1930. I found him mentioned in a history book for the 1st Battalion from 1909 to 1939. This provides some information regarding his movements prior to WW1. 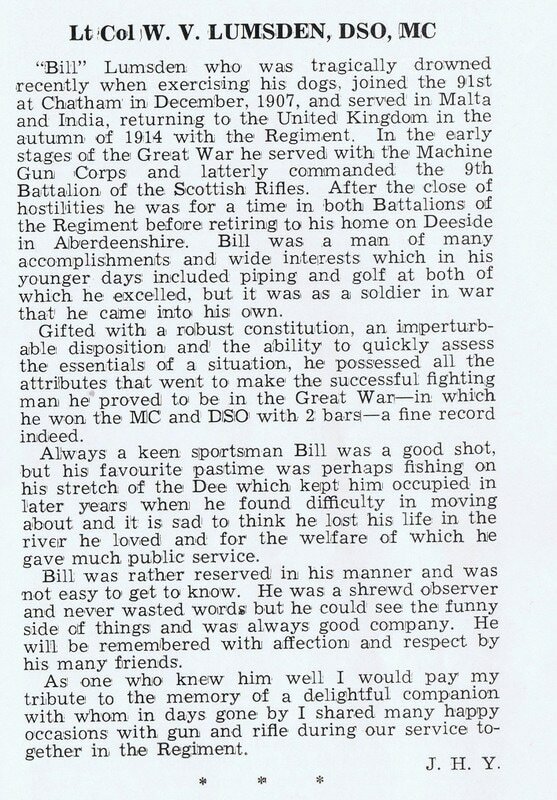 Unfortunately I was unable to find information explaining why he received his first DSO or MC, but did find some information from newspaper articles relating to his second DSO, which I have attached a copy of. I found some photographs of William which I will send you. I also found William’s obituary from the Thin Red Line from 1967. Sadly, he drowned whilst walking his dogs in Aberdeen.